Azadirachtin is found only in very small quantities (around 0.01%) in neem seeds and is highly sensitive to environmental degradation. Purifying Azadirachtin has always been a global challenge, but a basic necessity to develop quality, stable end-use neem formulations. AzaPureTM is the Azadirachtin Technical from neem seeds extracted through the technology and process researched and developed at Vittal Mallya Scientific Research Foundation, Bengaluru. 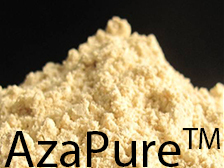 AzaPure has the highest level of Azadirachtin (40%+) purity reported so far in the world. AzaPureTM is produced from standard process and is essential to formulate end use neem products for application in agriculture, veterinary care and human health. VMSRF has protected it Intellectual Property Rights (IPR) by applying for a Patent on the process to extract Azadirachtin on one hand and Trademark for AzaPure on another. AzaPureTM is registered with US Environment Protection Agency (US EPA) and can be used to develop array of non-toxic and environment friendly neem products for the management of dreaded insect pests on crop plants. AzaSolTM is a ready to use, technically advanced, water soluble, Azadirachtin rich (6%), patented neem pesticide formulated using AzaPureTM. AzaSolTM is marketed in USA for eco-friendly insect control in agriculture, horticulture and floriculture.